Since the medieval times, the inhabitants of the Marches have had a reputation of being skilled craftsmen and artisans. The Marches style was not to reproduce established models but to push the boundaries and aim at perfection, to this end the Marches is kind of the Japan of Italy. From the shipyards of Ancona the largest cargo ships in the world were launched. Household items such as electrical appliances, footwear, clothing, mopeds, furniture and musical instruments are manufactured in the cooperatives of the Marches, supplying all of Italy and half the nations exports. In addition to their industriousness the people of the Marches are very academic and are constantly studying. 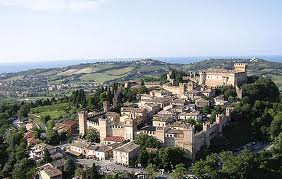 The university campus of Urbino practically coincides with the whole are of the city centre, as it does in Oxford. Forty colleges are located within the piazzas of Urbino. This Complexity, creativity and a love of effort can also be seen in the cuisine of the Marches. Cooks of the Marches diligently process all elements of food with no thought of conserving time or energy. In the Marches everything that can be stuffed, is stuffed, from large legs of wild boar to tiny olives. 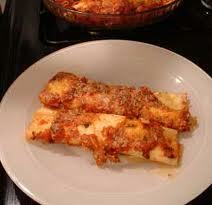 Large pasta tubes, cannelloni, are stuffed with asparagus and prosciutto and even calamari is stuffed with ground veal. Food is cooked for a long time and elaborate paper parathion techniques are used on even the simplest of ingredients. Olive Ascalane (Ascoli-style olives) are produced here and sold throughout Italy. Olives are stuffed with meat, prosciutto or a mixture of herbs , egg, Parmesan, nutmeg and cinnamon then the olives are dipped in flour, egg and then breadcrumbs, left to cool in the refrigerator, then fried in plenty of olive oil for a minute to a minute and a half. The Marches has many extremely laborious, complex dishes such as stuffed mutton head, stuffed pork rinds and ciarimboli, entrails seasoned with garlic, salt, pepper, and rosemary then dried indirectly by leaving to stand near a fire before being grilled. Another typically Marches dish to is Urbino-style snails which are stuffed with chicken gizzards. The Marches people love of cuisine and study has led to the region to become a place to study cooking seriously. At Porto Recanati, in Macerata, is the Accademia dei Brodetto (the fish soup academy). Any region that devotes a building to the study of a good fish soup has to be admired. Once a year in Monfoldo, probably the most serious of all festivals take place to mark the end of lent, the Spaghettata della Quaresima (Lenten Spaghetti feast). Legend has it that the village-born musician Amedeo Tarini was locked in a fierce battle with a local parish priest, so to please the priest and end hostilities Tarini promised many quintals of spaghetti with anchovies, tuna and olive oil would be provided to the priest, in full accordance with Lenten restrictions. Le Marche is a region in limbo, no one seems to know if the region is in northern Italy or southern Italy. To the northern regions, Le Marche is a northern extension of Abruzzi, therefore it is most certainly a region of southern Italy. However, to southern Italy, Le Marche is merely a continuation of the region of Romagna, therefore most definately a northern Italian region. It is due to this crisis of identity that the Le Marche region has such diversity in not only its history, traditions and customs, but more importantly it's cuisine and wines. Geologically speaking, Le Marche shares it's various soil structures with it's northern neighbours, Umbria and Tuscany. But climatically speaking, Le Marche is much more southern Italian, sharing it's maritime climate with it's southern neighbours Abruzzo and Lazio. But viticulturally speaking Le Marche shows the best of both worlds, taking it's grape varieties, viticultural, vineyard and wine making techniques from both it's northern and southern neighbours (click here for more information about The Wine Of Le March). 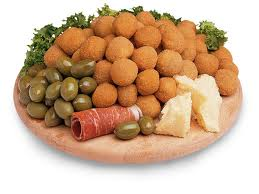 Olives ascalone - olives stuffed with meat (chicken, beef or pork), prosciutto, mortadella, cheese, eggs and bread and then breadcrumbed and fried. Vincisgrassi - lasagne noodles with a sauce of chicken giblets, chicken livers, veal sweetbreads, veal brains, prosciutto and marrow to taste. Urbino-style pork fillet - a pork fillet with a pocket cut in it which is then filled with frittata and prosciutto. Pesaro-style olives - they are not olives at all, but little veal steaks wrapped around a filling of prosciutto and basil. Stuffed rabbit - a stuffing is made with veal, mortadella, rabbit liver and heart, salt pork, garlic, nutmeg, cloves, grated cheese and breadcrumbs then the boned out rabbit is stuffed and tied then roasted on the hearth. Rabbit in Porchetta - a boned rabbit is stuffed with prosciutto cotto, ancetta and salami which is garnished with wild fennel sauce and cooked in an oven. Crocette - sea snails in Porchetta. Cuttlefish stuffed with cheese, breadcrumbs and eggs. Stuffed mussels - Mussels stuffed with garlic, wild fennel, rosemary, peeled tomatoes and parsley, then arranged on a baking dish sprinkled with bread and cooked under the grill. Caciuni -pastry crescents filled with pecorino, egg yolks, breadcrumbs, sugar an grated lemon rind. Bostrengo - a rice pudding with chocolate and pine nuts.